Want to know how to get rid of bedbugs in one treatment. One and Done Bed Bug Elimination in Kansas City . It is the process of using Vikane gas. bedbugsonline.com . At ZipZap BedBug Control KC we have the ability to insert sulfuryl fluoride into your home and hold it inside for 18 hours. After the 18 hour hold time we will then open all windows and doors to allow the Vikane gas to move from inside your home to the outside. 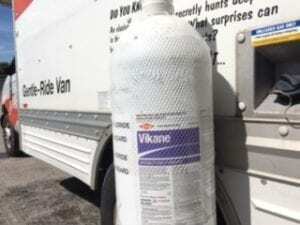 This makes for a safe and effective application to eliminate all stages of bedbug eggs, nymphs and adults from your home or moving truck. This is what is called One and Done bed bug elimination in Kansas City. Vikane gas is only used by qualified, licensed professionals. Bedbugs can be eliminated from your entire home with all its contents left in place. nothing to remove from the home. In fact, we want you to take nothing. This is to ensure we have fumigated everything. We would even like it if you would leave your vehicles in the garage, if possible to ensure those vehicles are fumigated as well. There is also no mess to clean up after a fumigation is performed in your Kansas City home. 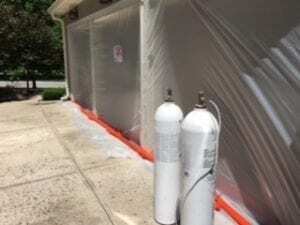 You have probably heard of fumigating for termites in the Southern states. Fumigating for bed bugs is the same process though we do not have to tent your home. We would tape and seal your home. Saving you the cost of tenting your home. Nothing to wipe down or clean after a fumigation for bed bugs is performed in your Kansas City home. This process is not a fog but a gas. It is a clean no worries way to 100% eliminate all stages of bed bugs from your Kansas City home.